Queensland’s Doug Klein has finished his amateur career in winning style after taking out the prestigious Keperra Bowl in Brisbane today. Despite a superb final round 5-under 67, Klein (Redcliffe GC) was forced to endure an agonising wait as South Australia’s Jack Thompson (Grange GC) came up the 18th hole with a chance to put the championship into extra time with a birdie. However, the 2018 Riversdale Cup winner missed the long putt and finished bridesmaid for the fourth time in a row at major amateur tournaments. 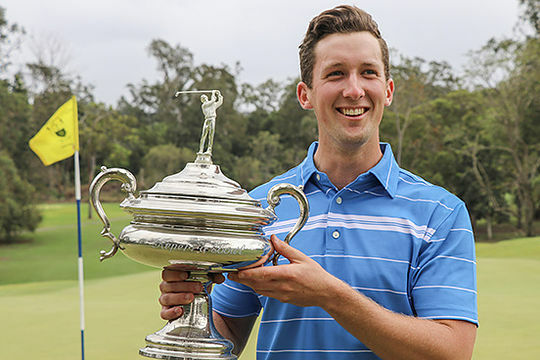 “I could not have hoped for anything more satisfying than this,” said the 21-year-old Klein, who will turn pro prior to the upcoming Queensland Open starting November 1. Klein, whose previous best finish at the Keperra Country Club was 7th place in 2017, performed superbly in the wet conditions to capture the trophy with rounds of 68-67-70-67 giving him a 16-under total of 272. He carded a total of 23 birdies and gave away just five bogeys and two double-bogeys across the four rounds. In accepting the Keperra Bowl trophy, the 21-year-old praised his coach, Wayne Rostron, for helping with the all-important mental side of his game. “Wayne and I came together early last year and my game has really developed in the past 20 months,” he said. “Golf had become almost my obsession, and I was religiously working on my game six days a week for about 18 months,” he said. Klein came into the final round trailing by a shot behind the trio of Charlie Dann (Pelican Waters GC), who won the title in 2016, Lawry Flynn (Brisbane GC) and Thompson. Dann and Flynn could only manage par rounds and settled for a share of third place alongside Kyle Michel (Shepparton GC) and William Florimo (Gailes GC).